Hartford, Conn. – A new study of parents' fast-food restaurant purchases for their children finds that 74 percent of kids still receive unhealthy drinks and/or side items with their kids' meals when they visit one of the four largest restaurant chains–McDonald's, Burger King, Wendy's, and Subway–despite restaurants' commitments to offer healthier options with kids' meals. This finding is part of a new report from the Rudd Center for Food Policy and Obesity at the University of Connecticut. 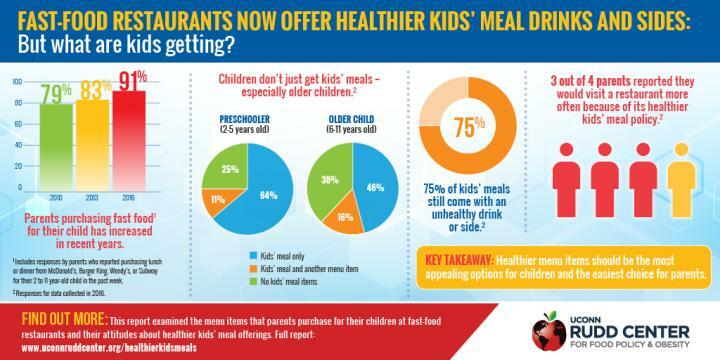 "We know that fast food offers parents a convenient, affordable option for feeding their families. But restaurants have a responsibility to make these affordable, convenient foods healthier. Most fast-food meals–even kids' meals–have more fat, sugar, and sodium than children need, and eating this kind of unhealthy food can have negative health consequences over time, such as obesity, diabetes, heart disease, and other health issues," said Harris.